They always want someone new. Giannis Antetokounmpo. Joel Embiid. Ben Simmons. Anthony Davis. Kawhi Leonard. Before that it was Kevin Durant and James Harden, Russell Westbrook and Chris Paul, Dwyane Wade and Steph Curry. Everyone, it seems, is eager for someone new to lead the NBA. Because LeBron James has been at the top of the basketball mountain for so long that everyone is tired of it. He hasn’t won an MVP since 2013 — proof that even voters want to give the award to someone else — but he’s been in the top four every year since. The accolades are long and impressive: 8 Finals appearances, including seven in a row. 3 championships. 4-time MVP. 3-time Finals MVP. 14–time All-Star. 11-time All-NBA First Team. 5-Time All-Defensive First Team. Rookie of the Year. Scoring Champion. 2-time gold medalist. And those are just the major accomplishments. Only haters and insane people insist he isn’t the best player on the planet. Still. After all these years. He’s averaged 27 points, 7 rebounds, and 7 assists for his entire career, the only player to ever do that. He’s done it for so long at such a high level that, after a while, it stops being impressive and starts becoming expected. It’s become routine rather than remarkable. Because we are full, even stuffed, on his greatness, we are no longer intrigued by it. What once was amazing is now mundane. He does what no one else does and the general public just shrugs and moves on. He has simply been too great for too long. And that has made us spoiled. We take it — and him — for granted. Whenever anyone else puts up the same numbers for a week that LeBron has for a career, people throw awards at them and begin clamoring for a statue to be erected in their honor. Unless you count losing in the Finals, he’s never really had the chance for a “comeback” season. Come back from what? He’s never had a serious injury and he’s never had an extended slump. He’s been in the top five of the MVP voting every year for the past twelve years. He routinely makes the extraordinary look ordinary. And he has for decades. One of the most amazing things about LeBron James’s career is just how long he has been in the spotlight and how much expectation has been placed upon him since he was an adolescent. He’s been transcendent since high school. He was on the cover of Sports Illustrated at the age of 17. He is the personification of the American Dream. The history of the NBA is littered with can’t-miss future superstars that missed completely. 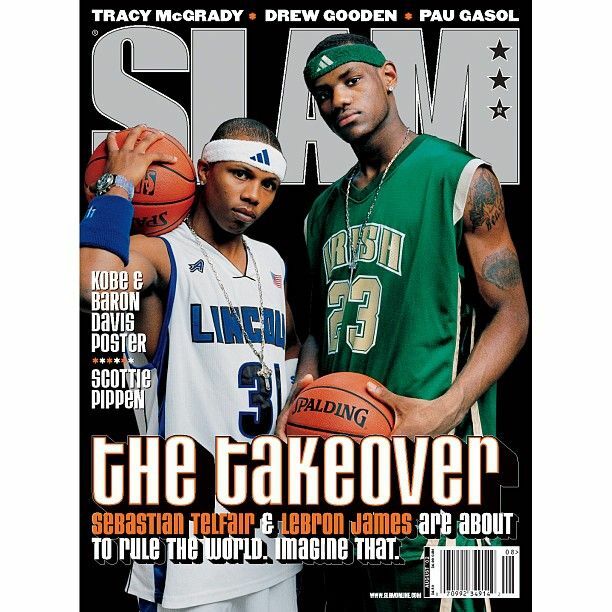 Among his own peers, there was Lenny Cooke and Sebastian Telfair. LeBron could have been another cautionary tale or at least a sign of unfulfilled potential. He was the unanimous number one pick in a stacked draft, the most hyped rookie in the NBA since Lew Alcindor. He put up 25/9/6/4 on the road in his first pro game. He was 18. In 2007, a mere four years after entering the league, he scored a playoff-record 25 points in a row to lead a glorified YMCA team featuring Drew Gooden and Boobie Gibson over the reigning kings of the Eastern Conference, the Detroit Pistons, en route to his — and the Cleveland Cavaliers’ — first trip to the NBA Finals. Instead of appreciating that improbable run and realizing it was special, most immediately demanded more. They expected immediate dominance and an armload of championships. When it didn’t happen, the criticism began and never stopped. He was branded as selfish, but, paradoxically, they also said he passed too much. They howled that he lacked the killer instinct of MJ and Kobe Bryant. The fact that Magic Johnson always made the right pass then flashed a smile on his way to five rings was evidently forgotten. Besides, when you have the vision and awareness to make passes like this, this, this, and this, just to name a few, it would be an insult to both your teammates and the basketball gods to keep the ball to yourself. He sees the game as a three-dimensional chessboard, moving pieces where he wants them while also visualizing four and five moves ahead. …though his performance — only a fraction of which registered in the box score — was anchored by the buoyant logic of making the best situational play. If given the space to do so, James will make the right call more often than almost any other player in the league. That itself can be terrifying for opposing defenses, who then are tasked with matching his precision or living with the results. The only appropriate response is exasperation. Wherever LeBron goes in the playoffs, heads hang. Shoulders slump. Palms turn up as teammates bicker. His virtuosity has made us so spoiled to the point that we are bored with it all. After that run in ’07, he wasn’t able to get back to the championship round for a few years. If I had to do it all over again, I’d obviously do things differently, but I’d still have left. Miami, for me, has been almost like college for other kids. These past four years helped raise me into who I am. I became a better player and a better man. I learned from a franchise that had been where I wanted to go. I will always think of Miami as my second home. Without the experiences I had there, I wouldn’t be able to do what I’m doing today. All of which brings us to the NBA Finals. His (as of now) 3–5 record in the Finals will always be the millstone fastened around his neck. Jerry West went 1–8 in the Finals, but he did so in an era before ESPN and Twitter and Crying Jordan memes. Even those that try to point out that James’s team was the underdog in nearly every one of those series are quickly drowned out by less rational but still louder voices that have branded him a loser and a choker. Well, in 45 NBA Finals games in his career, he’s averaged 27.7 points, 10 rebounds, and 7.5 assists on 54.5% true shooting percentage. That’s objectively great, particularly when considering it is on the biggest stage against one of the best teams in the league that season. He is also 2–0 in Game 7 in the NBA Finals. Incredibly, he has increased his greatness against Golden State. In his 18 NBA Finals games versus the Warriors — inarguably one of the greatest teams to ever step foot on an NBA floor — he has averaged 32.8 points, 12.2 rebounds, and 9.2 assists while maintaining his 54.5% true shooting percentage. In 2016, he became the first player in NBA history to lead all players on both teams in all five major categories — points, rebounds, assists, steals, and blocks — for an entire playoff series. And he did so not against a first round cupcake, but in the Finals against the team with the most wins in NBA history after being down three games to one, making good on his promise to bring Cleveland its first title in a half-century. In those seven games, he averaged 29.7 points, 11.3 rebounds, 8.9 assists, 2.6 steals, and 2.3 blocks. The following season, after Golden State added another future Hall of Famer to their roster, the Cavaliers lost in five games despite LeBron playing even better and becoming the first player in history to average a triple-double in the NBA Finals with 33.6 points, 12 rebounds, and 10 assists, along with 1.4 steals and 1 block per game. Yet, oddly, it was his 2015 NBA Finals performance that may be his most impressive. After losing Kevin Love earlier in the playoffs and Kyrie Irving in overtime of Game 1, LeBron was flanked by zero All-Stars. For Games 2–6, the other starters for the Cavs along with James were Matthew Dellavedova, Timofey Mozgov, Tristan Thompson, and Iman Shumpert. Not exactly a murderers’ row. Yet, despite that, the Cavaliers won two games in the series and LeBron even received four votes for Finals MVP in 2015, but lost to Andre Iguodala, the “worst Finals MVP of the past 30 years.” Iguodala won the award because of his defense of James, who only averaged 35.8/13.3/8.8. Yeah, he really locked him down. All of those stats and accomplishments are incredible, but instead of applauding him, far too many people criticize LeBron for what he hasn’t done or won’t ever do. They ignore the fact that he has been star-crossed, reaching his absolute apex at the same time that a team rose from the Pacific that has had the most dominant four-year run since Bill Russell’s Boston Celtics in the 1960s. That’s not an excuse, but it is an added layer of nuance that most gloss over. If you’re going to point to his Finals record, you also have to consider the teams he played against. You can’t pick and choose history. He is the all-time career leader in VORP. He has the most career assists by a forward. He is the only player in NBA history to average at least 25 points per game for 13 straight seasons. He is the only player in NBA history to be in the top 10 all-time in points and top 15 all-time in assists. And his performance in the playoffs is even more impressive. He holds the postseason records for points scored. He has the highest scoring average in both Game 7’s and elimination games (what a choker). He has the most playoff games of scoring twenty or more points. He has the second most triple-doubles in playoff history, but the most while also scoring thirty or forty points. He is first all-time in both playoff Win Shares and VORP. He is the only player in NBA history in all-time top five postseason points, assists, and steals (and is also top ten in rebounding). Then, there is his performance in the NBA Finals. He has the most triple-doubles in Finals history. He has the most three-pointers made in Finals history. He’s the only player to average a triple-double in a Finals series. Finally, he’s the only player to ever average 25 points, 10 rebounds, and 7 assists in a Finals series and he’s done it three times. No big deal. Just more of the same. He’s the most unique player the Association has ever seen and, despite what many would like you to believe, he is one of the all-time greats to ever don an NBA uniform. Who’s a better passer, and it’s not remotely debatable? LeBron. Who’s clearly a better rebounder? LeBron. Who’s more likely to drop 40 or 50 on you? Michael. All I am saying is that neither Oscar, Jerry, John, Larry, Magic, Kobe, nor Michael has ever played more consistently beautiful, breathtaking, and efficient basketball than LeBron is playing right now. If you don’t think LeBron is as good as Jordan, that’s beyond fair and understandable. If you think that he creates unnecessary drama, no one will argue with you. If you feel he holds the rest of the league hostage with his free agency decisions, you wouldn’t be wrong. If you believe he’s done and said some misguided things earlier in his career, like The Decision and the “not two, not three, not four…” announcement, you’d be completely correct. However, not only has he shown his ability to learn from those mistakes and lapses in judgment, but none of that can impugn his ability on the basketball court or his influence off it. In recent years, he hasn’t shied away from being active and outspoken on social issues, from the Miami Heat all wearing hoodies in honor of Trayvon Martin to the “I Can’t Breathe” shirt to his tweet to the president. He’s the most powerful athlete in NBA history — possibly any sport — and has wrested a fair amount of control for not just himself, but all players, after decades of being vulnerable pawns at the mercy and whims of owners. He values winning above all else while also seeing the larger picture beyond sports. Regardless of how you feel about LeBron James or his place among the greats, I suggest you take some time and think about what he has been doing on the basketball court night in and night out for a decade-and-a-half with no real drop off. It is rare. It is special. And it will not — cannot — last forever. So appreciate it and bear witness while you still can, because at some point, sooner than later, he will walk away and leave the game behind. And we’ll never see another player like him ever again.